Cat Grant: Time is eleven-twenty three. I'm on the hunt for the Blur, I'm betting she'll come here to the night museum, looking for artifacts. And when she does; surprise you're on America's unfunniest home videos. Lois Lane: As once you lived Osiris so shall you live again. Through the ritual of life, I shall restore your heart and claim your body for the soul. Cat Grant: I will never understand liberals. 200 too strong for 201? Having to follow episode 200 "Homecoming" was always going to be a tough gig. What I think was meant to be a highly climactic episode perhaps didn't meet the standard of the previous, and maybe finished a bit too similarly. 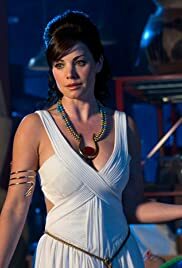 A disappointment in episode was that the main plot involving the Isis necklace did not hold much integrity in of itself. It seemed like it was all fuzz waiting for the final two minutes of the episode. Nevertheless, for smallville fans this episode has been long awaited for. It was probably never going match our expectations, but it was an amazing moment for the characters which was well set up by the previous seasons and episodes.